"Palm Trees, The PCH and now PMAGs," the company said on Instagram. "We're shipping all our magazines to California and have a limited edition shirt to celebrate the occasion." The announcement comes after Judge Roger T. Benitez of the District Court for the Southern District of California ruled on Friday that California’s ban on the sale or possession of magazines capable of holding more than 10 rounds of ammunition was unconstitutional. Magpul, which makes one of the most popular 30-round AR-15 magazines in the world, took the opportunity to begin selling its products in the state, which had previously been outlawed. They announced sales of the magazines to Californians had begun on Tuesday. 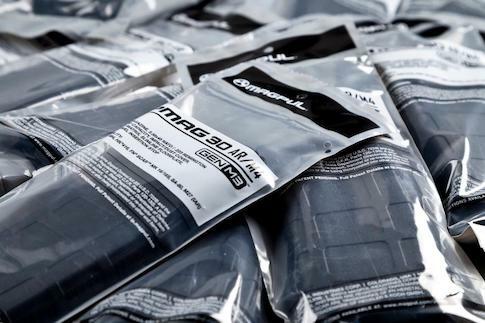 "Magpul is now accepting direct orders for all magazines to California addresses," the company said in a post on Tuesday. "Due to the momentous Mar. 29 decision in the NRA and CRPA-backed Duncan V. Becerra lawsuit, declaring California's ban on ‘large capacity magazines' unconstitutional, a little piece of freedom has been restored to California gun owners. You can also show that you're on the side of taking back more of what is rightfully yours with a Magpul Free the Republic T-Shirt." As Magpul celebrated reopening sales of its previously banned products in California, the attorney general told the Washington Free Beacon it had filed a request to stay the court’s decision. That would allow the state to begin enforcing its magazine ban once again and likely end Magpul’s new sales within the state. "California leads the nation when it comes to gun safety," Attorney General Xavier Becerra told the Free Beacon on Tuesday. "Yesterday, we sought a stay of a court ruling that jeopardizes our state's firearm law prohibiting individuals from acquiring new large-capacity magazines. We intend to protect our people and our gun safety laws from senseless attacks. We refuse to go backwards." Magpul has previously worked against new gun-control provisions that ban the sale or possession of its products. The company moved its operations out of its former home state of Colorado in 2013 as a protest after that state instituted its own magazine ban. The company handed out free 30-round magazines to Coloradans before the ban went into effect. They did the same for citizens of Vermont in the lead up to their state’s ban. The Ninth Circuit is expected to rule on a stay in the case against California’s magazine confiscation scheme shortly.